Migraine stops play: a repost today about the humble crow. Could it one day rule the world? Who could make the humble crow into a film star? Alfred Hitchcock seized upon the work of Daphne Du Maurier. It lent itself to the big screen, this bold literature. First he took Jamaica Inn, a year later, Rebecca. And more than a decade after that, he turned to a collection of her short stories written in 1952 called The Apple Tree. One of its stories was entitled The Birds. Told from the viewpoint of a coastal Cornishman, it explores what would happen if our avian sphere dwellers began, inexplicably, to turn on us. The makers of the film are said to have rounded up and trained hundreds of gulls, ravens and crows for some of the stark attack scenes. The results were striking because we expect the crow to co-exist. They do that, crows. I have a great affection for the small black figures I see wandering across a field or inspecting something on a road. I always wonder: what can possibly be going through their heads? More than one might imagine, apparently. Defining him is not simple, because he does not fit into boxes. He says, simply, he is a hacker. Klein got to watching the crows in his back garden, and arguing their usefulness to society with a neighbour over the fence. In a short lecture for TED (Technology, Entertainment Design, a non-profit organisation which aims to disseminate ‘ideas worth spreading’) Klein outlines some of the breathtaking problem solving skills of our corvid friends. Take a look. He showcases film of a crow who is faced with a long jar, which has food at the bottom. The only tool has he has is a long piece of wire. He takes the wire, bends it to form a hook, and hooks the food out. Klein has has created a vending machine for crows. He has spent the last ten years training them to pick up a coin and insert it into a machine to attain a reward of peanuts. His final words in this short piece of film are an oddity: he says, why not train the crows to do something useful, instead of reviling them? They could clear litter, for example: or select electrical components to order. One strange example might support this: that of Moses, an American crow who adopted a stray kitten, fed it and nurtured it to full strength, and made a fast friend for life. But Klein’s leap brings me straight back to Hitchcock with a bump. All my corvid idealism evaporates in an instant. Because they are already learning. And they have attitude. 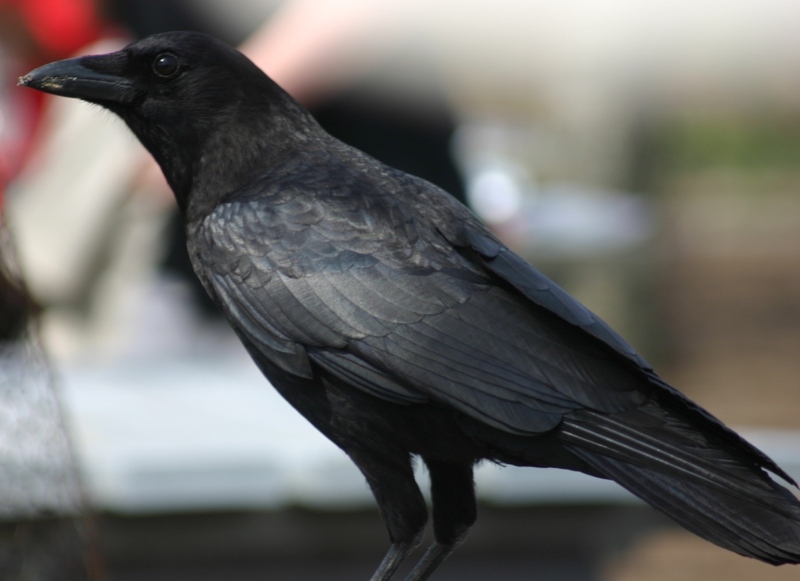 Klein cites the University of Washington, where some students were set to round up a group of crows, weigh them and measure them for a simple set of experiments. They let them free again: and when they went home the crows set up a racket,shouting at the students and making themselves generally objectionable. The next day, they did the same with those who had worked on them. And the next week, and the next year: in fact the students had no peace until they left their studies all together. Later, returning from the big wide world for some conference or other, the crows still remembered them and made their dislike unsettlingly clear. I think we should leave crows to get on with their own business. They certainly seem very busy in the lanes and fields around us. But doing what, the conspiracy theorist in me wonders, Roger? Crows have never been on my best friend list. South Australians (my birthplace) carry the sobriquet “Crow-eaters” – never found out why – but I can imagine the pioneer blocker carving out his acre in the scrub to the music of constant cawing crows and eyeing them hungrily. We weren’t fussy back then! Nope – whatever works at a time like that, WP! I too have a big affection for the family of corvids – I remember this post! And those clips. which is a fascinating read. Thanks Pseu 🙂 Must look this one up. Thanks! I heard the actress Tipi Hendren being interviewed about her part in Hitchcock’s “The Birds”. She said the attack scenes were filmed by tying the birds to her with elastic!! So the birds were flapping to get away (probably thinking “what the hell are these humans doing?”) but couldn’t. The dresses she wore had small holes in to allow the elastic through and filming was carefully choreographed to hide the elastic ties. Ellie, what an amazing piece of information to add to the thread, thank you! Poor old Crows. It cannot have been a nice sensation being tied to little girls. That was one scary film that Hitchcock foisted upon us. Not a nice vision, no, Lou! A crow never forgets, and I will never forget the first time I saw The Birds. Watching it now, one can see some of the contrivances, but, it still holds me in suspense, Kate. I enjoyed this post anew – and do hope you are feeling better asap. Those migraines can be horrible. Rest. Thanks, Penny. It’s been three days but it’s lifting a little now. The post is great, the part at the end about the students is really scary. Migraines are awful. But crows are pretty cool. Feel better, Kate! Good to have someone from the Pro-Crow camp, Weebles 🙂 Thanks so much. Clever creatures 😀 MAkes you think, though. They’re problem solving every day. I looked at that in the midst of my headache and it did, indeed, make me feel better, Hudson. You are clever. Dear Kate, I’m so sorry to learn that you have one of those horrific migraines. I hope you have some medication that helps you deal with the pain and makes the migraine vamoose. Thanks for the two crow links. They seemly to really be intelligent birds and I find myself liking them. Peace. I know what you mean, Dee: they are so very canny, aren’t they? Oh, Kate. Here’s a dark room and a cold pack and good drugs. I hope your headache has already eased by the time you read this note. When we went to the Center for Birds of Prey (near Charleston), they went into a lengthy talk about the intelligence of the crow and cited this video. The guide said they harassed other birds there, too. Feel better, Kate. Hope the pain dissipates in short order. Thanks Nancy. Think it’s on its way out now. Wow: that is a reason for appreciating them, Debra, to lose so many and in such a way! Humble crow, my foot. 🙂 But they are clever, I agree – I’ve seen one press down on the trigger button of an outside drinking fountain and sip from the trickle of water he managed to make flow. Yesterday I watched a crow peck at a blushing pear on the tree outside my window, turned away only to hear a great squawk – and there was the crow on the lawn together with what remained of the pear after it crashed to the ground… I couldn’t help laughing. He on the other hand just kept picking at it, enjoying a lunch he didn’t have to share or even defend from his fellows. Er, I command that migraine to beat a hasty retreat! Very smart birds – they have dialects depending on where they live! That I did not know, Gabrielle. What an amazing thought. So I wonder if our London crows have cockney accents? Born within a squawk of Bow Bells, and all that? Oh Kate, another migraine. It seems quite some time since the last one though. *hugs* that today its gone! Thanks so much, Tandy. At last, it has dwindled! The relief! Crows are the nemesis of golfers because they love stealing golf balls off the fairway – this has got me thinking that perhaps there is a way to train them to retrieve lost balls instead! Hope you feel better soon, Kate – did you see the Harvard Medical article on implant therapy for migraines? I didn’t, BB. Shall Google forthwith. Thanks! I implore you, Kate. Please stop giving me ideas. I’ll never get anything finished! This is such a creative time for you, Cameron! All the best with your latest novel. Your drive is just amazing. Here’s sending you wishes for a very wide audience indeed. A solid hit. Your post was informative and creative, and you provided two of my loves: Hitchcock and TED. When I was a teen living in the country, I found a book about a man who had a crow he trained to talk. Fascinating. Yes, they are very smart birds. Great post. Go down and bolt the door.